Family of Hobden are relative latecomers to Canada emigrating from Sussex, England in 1870, settling Berlin and later Toronto. Born in Blind River Ontario, raised in Oakville and Burlington. Attended Gladys Speers PS, W.E. Breckon PS, Pineland P.S. and Nelson & MM Robinson HS’s. Graduated Civil Engineering University of Waterloo 1987, moved to Milton in 1988. Married with three children & wife, Helen a teacher with the Halton District School Board. Canadian History is a consuming passion for David. 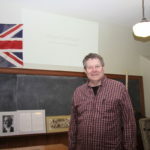 His principle research area is early Canadian Military History and more recently Mails and Dispatches of the War of 1812, including mails carried on Iroquois Shore Road through the south section of the county. He considers himself fortunate to have lived almost his entire life in Halton County but laments watching our history swallowed up by the tide of progress. Collecting interests, beyond early Canadian military correspondences include the postal history of Halton County, concentrating on the pioneering period between 1815 and 1860. Always had an appreciation for our past, and an acknowledgment of what it has cost generations before us to provide us with the Society we have today.